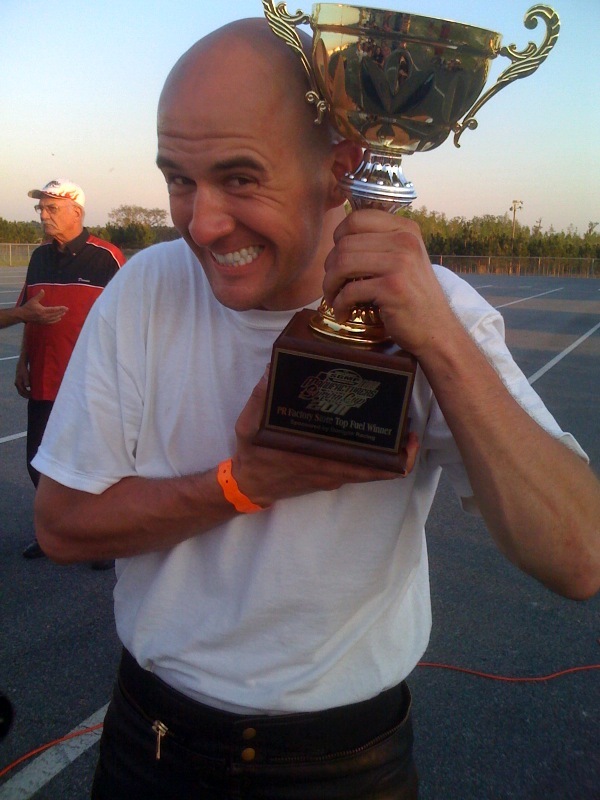 There’s a new speed king in the world of drag bike racing. 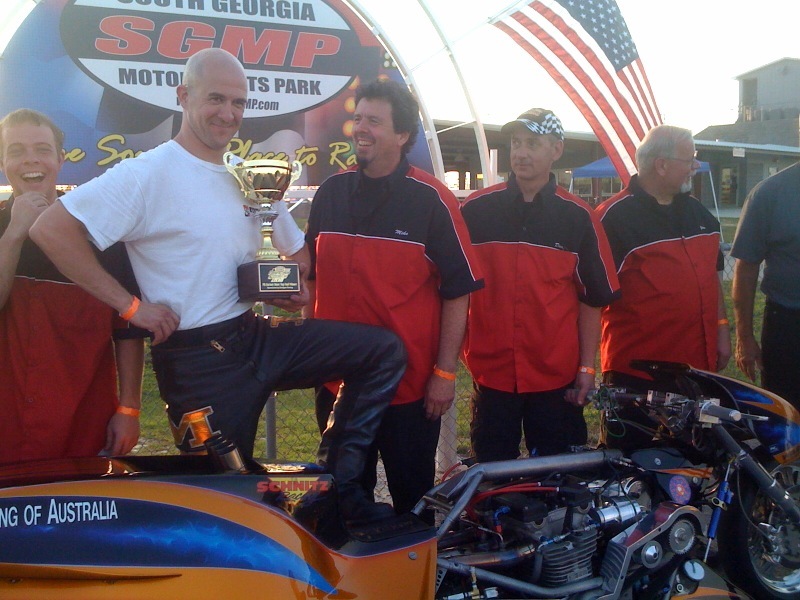 Heading into the Spring Manufacturers Cup at South Georgia Motorsports Park in Cecil, Ga., April 8-10, Korry Hogan had been over 250 mph once before, but the fearless pilot was unable to back up the impressive speed within one percent to make the record official. Now there’s no disputing Hogan’s unprecedented speed. On Saturday night Hogan qualified on the pole with a run of 6.04 at 255 mph. In the final round of eliminations Hogan backed up the record with a 6.03 at 254.62 mph. Team owner Mike Dryden echoed Hogan’s point of view. In the process of securing his mph record, Hogan was able to accomplish another impressive feat by defeating his rival and No. 2 qualifier, Larry “Spiderman” McBride’s 6.15 at 219 mph. Hogan collects the third Top Fuel victory of his career and his 255.00 replaces McBride’s former record of 245.36. Hogan’s dream weekend couldn’t have started much worse. Hogan was forced to watch the first round of Top Fuel qualifying on Friday night from the grandstands after his team’s transporter broke down in Tenn. on the way to the race. Hogan’s first pass of the year on Saturday afternoon resulted in a violent shut off due to a fuel delivery problem. “It felt like a grenade going off in my face,” Hogan said. Ten-time champion McBride had nothing but praise for his record-holding foe. Hogan wasn’t the only Cup competitor who set a record in the finals. 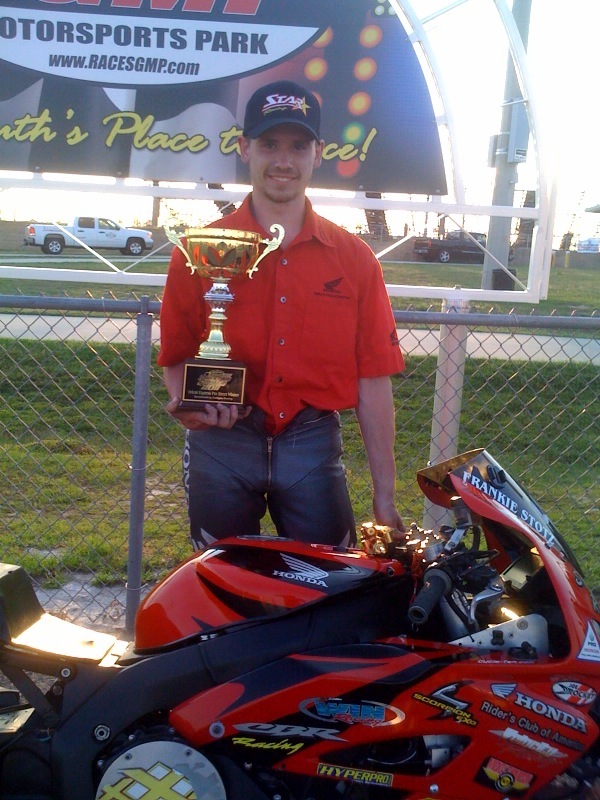 Honda-backed Pro Street racer Frankie Stotz recorded the quickest street bike pass ever with a 7.105 at 199 mph to defeat Rob Budgell’s 7.26 at 187 mph. Stotz leaves the racetrack with the first record of his career, his first victory and his first final round appearance. Stotz’s 7.10 surpasses the former record, Bud Yoder’s 7.11. Pro Street legend and Frankie’s father, Kent Stotz called it the greatest moment of his career. Another notable run of the weekend came in the opening round of Top Fuel when Takeshi Shigematsu of Ehime, Japan recorded the quickest Nitro Harley pass ever at 6.124. The only bad news for Shigematsu and his tuner Don Johnson is the world’s quickest import motorcycle of McBride was in the other lane and took the victory with low elapsed time of the meet at 5.964. 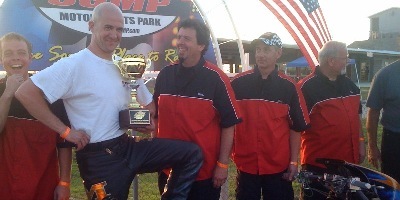 It was announced during opening ceremonies that Dunnigan racing will put up an extra $1,000 to the top qualifier in Top Fuel at the Cup Finals at SGMP in November. A great turnout is expected Nov. 11-13. It was a great weekend and great numbers. We all worked very hard to make it a great race & that it was!